The launch of Mark Hennig's training stable in 1993 was a racing rarity with its immediate impact in major races. He parlayed a strong start into one of the most influential training jobs of a generation, helping to develop Edward P. Evans' stable into a powerhouse on the track and a feeder for a vaunted broodmare band. As the tide began to change in the mid-2000s, Hennig had to rebuild with owners like Lee Lewis who supported him from the start but carried far fewer horses than the dozens he had received every year from Evans, and from developing new clientele even as the owner ranks contracted significantly in North America. "I was very fortunate to have the kind of horses I did starting out," said Hennig, whose first stakes winner, Star of Cozzene, swept the Gr1 Arlington Million and Man o' War Stakes along with the Gr2 Caesar's International and Manhattan Handicap in 1993. "There are a lot of trainers and owners who are capable of picking out nice horses and training them too. It's all about having the access to them. I have had years when I didn't have the access to them and I think it's shown. It's no different than a basketball coach. It's a lot easier to coach a team with Lebron James on it than to coach a team with me on it." Hennig, 54, always seemed to have at least one marquee horse he could count on, like Wesley, a striking gray who captured the Gr2 National Museum of Racing and Hall of Fame Stakes at Saratoga in 2008; and the fleet filly Merry Meadow, who clicked off four Graded stakes triumphs in 2014 and '15 in the filly and mare sprint division. Little by little, depth and quality increased and Hennig, based at Belmont Park and Saratoga in the spring and summer and Gulfstream Park in the winter, now sits in a plumb position. His 2018 season was his best by purse earnings in 10 years and featured a return to the Triple Crown trail with the meteoric Strike Power, who sped to victory in the Gr3 Swale Stakes at Gulfstream Park around one turn in just his second career start. He then finished a solid second in the Gr2 Fountain of Youth Stakes over a route of ground, only to struggle after getting caught up in an intense pace duel in the Grade 1 Florida Derby. In 2019, Hennig is back on the Triple Crown trail with Bourbon War, a colt with a resumé more similar to his trainer's previous classic runners Personal Hope and Eddington. Personal Hope was one of the first horses Hennig received when he went out on his own in late 1992, after five years as an assistant to D. Wayne Lukas. Hennig was there for a nice stretch of heady days for Lukas Racing, with Hall of Famers Winning Colors and Lady's Secret and Horse of the Year Criminal Type all in the shedrow. Lee Lewis had horses with Lukas at that time, as did the Team Valor syndicate led by Barry Irwin and Jeff Siegel, who were so impressed with Hennig that they presented him with an offer that would spark his own career. At age 27, Hennig became the private trainer for the Team Valor roster, with the caveat that he could also oversee six horses for other owners. Lewis sent him Personal Hope, who had started once for Lukas as a juvenile in 1992 before going to the sidelines with an issue. Hennig also filled the half dozen "public stalls" with horses owned by Evans. Between the three sources—Team Valor, Lewis and Evans—Hennig got off to a momentous beginning. While Star of Cozzene starred in the turf division for older males, Personal Hope immediately landed a dirt maiden win at Santa Anita and would go on to glory in the Gr1 Santa Anita Derby in 1993 before finishing fourth in the Kentucky Derby. Star of Cozzene tore through that same season with six Graded stakes wins and developed an epic rivalry with Claiborne Farm's homebred Lure, who would beat the Team Valor runner into second in both the Gr2 Turf Classic on Derby Day and the Gr3 Dixie Handicap on the Preakness card, before Star of Cozzene turned the tables with victories over Lure in the Manhattan at Belmont and the Caesars International at Atlantic City. They were both entered for another showdown in the Arlington Million, but after a spate of heavy rain, Lure was scratched and Star of Cozzene strolled to a 3 1/4-length victory at 4-to-5 odds. "Star of Cozzene was a real hard-trying horse," Hennig said. "When it was soft, there was no beating him. We had Star of Cozzene with Wayne and he was a nice horse, not beat far in the Breeders' Cup Mile. After that, Team Valor sent him to Francois Boutin in France, and when he came back it looked like it just didn't agree with him. He was light and had tailed off. It was an amazing turnaround once he got back here and started flourishing. The one winter we had him in California it rained a lot and that really got his season rolling. He went back East and had that great series with Lure. Where Lure was dangerous on firm turf, Star of Cozzene was just terrific on soft turf; and when he won the Arlington Million, it had just rained and rained, and he won it easily. We had a lot of fun with him." 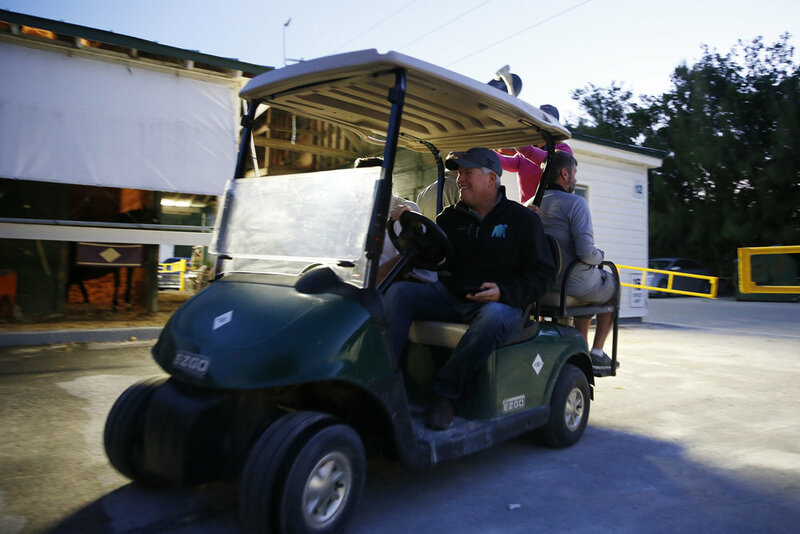 Growing up in central Ohio, Hennig spent much of his high school years on the backstretch of Beulah Park outside Columbus, where his father, John, was a top-flight trainer who would occasionally make his presence felt at Keeneland, Churchill Downs, and in South Florida. The elder Hennig ended up with a barn at Churchill with a staff that not only included his son, Mark, but also eventual trainers Kiaran McLaughlin and George Weaver. It was there that McLaughlin met Mark Hennig's sister, Letty. They have been married for more than 30 years. "Growing up, we would all work in the barn," Hennig said. "We would go in real early in the morning and, before I had my driver's license, I would get a ride home and get ready real quick and go to school. I would go back there after school and maybe run a few horses. The work ethic was instilled in all of us that way. It was about good horsemanship and working hard. When I went off to Ohio State for college and came back, my dad encouraged me if I was going to be in the horse business and wanted to train horses that I should work for some other outfits. I think that is the most unselfish thing any father could do for their son. He introduced me to Jack Van Berg, and I worked for him for a while and then I went to work for Wayne after that. I was so lucky to have that kind of foundation for my career."